Bettina 187 Hit Nail Polish You Are Such a Square, Months ago my cousin went to Puerto Rico and I jumped on the chance to get some Bettina polishes. I had her hunting down all the beauties I wanted from various stores and I've been holding on to them for so long. I finally decided to pair one of them up with another polish purchased from Etsy shop Hit Polish called You're Such a Square. This was during my phase of glitter when I was purchasing mini bottles like mad trying out as many as I could. 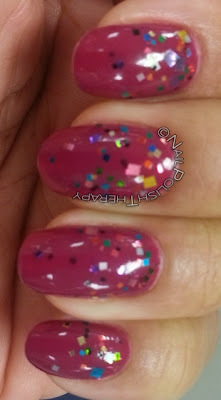 Bettina 187 is a creamy magenta with awesome formula. I should have used 3 coats for better coverage only because my nails curve so much. I decided to use HP YSS as a gradient on each nail to show the square shapes of the glitter. It spread very easily and the various square shapes made it look very festive. Unfortunately this color did not wear as good as I would like. The edges wore within 1 day and it started to chip within 2. I was surprised because I've heard so many great things about the wear and application of Bettina, This is the first of many more Bettinas so hopefully the others will be better. Thoughts? Feelings? Concerns?